A night of transcendence. It was Van Dyke Parks, in rare form, with a beautiful miniature orchestra, a songbook of treasures and an audience in love with every moment. It remains among the most glorious nights of music I have yet experienced. Of course, it’s true. The man is no run of the mill genius. He is a charming, hilarious, singular genius. His expansive approach to songwriting, glorious melodicism and ingenious word-play, in conjunction with great orchestral propensities, whether writing a song for himself, or with famous friends like Brian Wilson or Ringo Starr, all merge to create a songwriter unlike any other in these modern times. But this was a farewell, sadly. Because of recent hand surgery which hinders his piano playing, he decided to withdraw “from the glare,” as he put it. This was the first of a two-night farewell performance at the Largo in Los Angeles, played to a packed audience of fans, friends and luminaries. 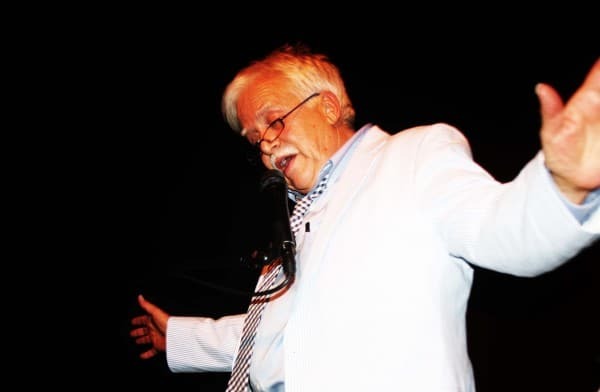 What he created for these last shows was the essence of what we love the most about Van Dyke Parks: he took us on a remarkable journey through his songbook of miracles, stopping only occasionally for some hilarious, and also serious, sermonizing. One of the great orchestral arrangers and composers of our time, he surrounded himself on this night with world-class musicians (including cellist Cameron Stone, Don Heffington on drums, David Stone on bass, Peter Kent on first violin, and harpist Amy Shulman), who realized the complexities of his compositions with beautiful passion and poignant precision. That triumph is not abstract. It’s very real, and contained in the words and music of his songs. We knew going in that this was bound to be an emotional show. But that well was deepened by the momentum achieved as song followed song, and by the beauty, whimsy and instrumental zeal instilled in the writing and performance of these songs. It was also deepened by the presence of so many of his friends in the audience and on the stage. Besides Eric Idle, the one pal who received the most attention was Randy Newman. (With Randy former Warner Bros. CEO Mo Ostin and president, and famed producer, Lenny Waronker). Like Randy, Van Dyke has long been a man concerned with the integrity of the popular song. “A song shouldn’t fall apart on the street like a cheap watch,” he said. His don’t. These are enduring, lovingly conceived songs, as sturdy as good songs are sturdy, and connected by a luminous wit and love of language. “An Opportunity for Two” from Jump, was a revelation, sumptuous in its joyful tunefulness, like little kids holding hands and skipping together through a glade. It’s a perfect marriage of words and music, of sweetness and purity. It is a ticket to another time, a different world, if you will. All his songs are. Though not back to the 19th century or anywhere specific, but to a realm of his own creation, similar to our world in the way a Dickens narrative is similar to our world yet distinct; it’s a parallel world where nothing is random, and an engaged author is making choices to charge, charm, mystify, celebrate and enervate these human journeys. He shows us in every song just how much songs can do. More than most humans would ever consider. “Heroes and Villains” is a perfect example, an expansive epic Beach Boys song he wrote with Brian Wilson, which was so distinct from their world that certain Beach Boys actively rallied against it. It’s a song that breaks new ground, something which never appeals to conservatives happy with the old ground, or the sand, if you will. Heady equations continued to abound all night. Not unlike being in the presence of a famous mathematician proudly displaying newly discovered complexities of great beauty, you could feel his pride and joy. Intricate and infectious rhythms invigorated all these arrangements, woven with exhilarating string passages and his signature, glittering harp glissandos. (“That harp!” people rejoiced after; not since recent Marx Brothers screenings have there been so much harp-talk.) The brave intensity in cellist Cameron Stone’s eyes as his fingers flew over the cello neck in polyrhythms was wonderful to behold. It was a concert of much grace, wonder and elation. But none of the orchestral virtuosity would add up to much if not for the songs. Of all the masterpieces this man has created, few resounds as deeply as “Orange Crate Art,” the title song of the album he did with Brian Wilson about the iconic art of our western state, and the spirit of that art and those artists. It’s pure Van Dyke, about the intersection of the timely and timeless in art and life, about imagery forever etched in our sentimental hearts, about melodies of great ardor and purity. It’s about all the beauty one human can contain, and contained, remarkably, in just a handful of minutes. Its performance was stunning. On vocals, in addition to the man, were Inara George and Gaby Moreno on the first night, in addition to Joe Henry, and on the second night Joe Walsh and Kimbra. Van Dyke brought an affectionately dynamic “Sailing Shoes,” written by Inara’s father Lowell George, whose capacious spirit was smiling through his song. Van Dyke also strode onto some new, unbroken ground by performing some spoken-word with orchestral backing, using Lawrence Ferlinghetti’s, “I Am Waiting” which was electric in its acoustic intensity, and signaled what is coming next. Joe Henry, who is now not only a legendary songwriter-singer but also a producer of great achievement, came on to sing “Death Don’t Have No Mercy,” by the Rev. Gary Davis. He sang it beautifully, with deep respect for the man at the keys, and a delivery of quiet, simmering soul. In the heart of the song, Van Dyke played a piano solo. But rather than a single note solo, as expected, he performed a chordal solo, all big extended chords ascending and overlapping, echoing and pulsating with shades of Ellington and Evans, a cubist painting fleetly created in the middle of the “American Gothic.” It was awesome, even mystical, in its fluid gravity. Discussing this solo afterwards with Cameron, the cellist, I learned that it was because of Van Dyke’s hand injury that his playing was restricted, and he couldn’t play any single note solos. It brought to mind something he said years ago, in regards to finding freedom within the strictures of song form, which he told me he learned from Krishnamurti: “Limitation creates possibility.” Rather than be diminished by his inability to solo on single notes, he was liberated, and created something entirely new, and exquisite. In other words, there are no excuses. If you find yourself restricted in any way, use that hindrance to soar to new possibilities. May Van Dyke hold back time forever. Thank you maestro for a magic night.